This is intended to dispel any myths or opinions quoted as fact as to the use of the HS and HIF series carburetors in a blow thru turbo or supercharger installation. You can successfully use the HIF or HS series carbs for blow thru with the proper modifications. These modifications are not hard and can be done by anyone possessing the time and patience to modify and tune their car. Myth One: Blowing thru an SU will cause the carb to explode, burst, spit fuel everywhere, change funny colors, or simply dissolve into a gas cloud. Although I would like to see any one of these happen for simple bragging rights, it is simply not so. The SU is really durable and with considerations made to condition and setup will do none of the above. In all cases, these concerns are mostly fear rather than fact. Myth Two: You need to enclose the carb in a pressure vessel to get the venturi effect to work. Wrong again, these carbs can be sealed to make the system work without going to dramatics. This is one of the best reasons why you should use an SU in a blow thru set up. Carbs work on a pressure variance, not atmospheric vs. vacuum. As long as air is passing from the front to the back it will pull fuel and run providing you have done everything right!" Ok, so I have told you what is wrong, now lets get to what is right! Tight throttle shafts: "Either with an oversized throttle shaft or a ball bearing conversion"
Solid throttle plates: "Makes tuning so much easier"
HIF44 throttle shaft seals turned backwards: "They are used in the Metro turbo carbs that way for the same reason, they are intended to seal under vacuum in the NA version. Backwards, they will seal against boost." Plugged fuel bowl vents: "This is an important step"
Overflow spigot: "I like to hook a boost line to this referenced before the carb with a check valve to prevent vacuum from drawing on it under non boost conditions. Others plug it, this is something I suggest you try both ways and use what suits you"
Plastic floats: "The factory plastic floats work fine in a boost application as they are injection molded and quite stiff. However, filling them with foam and re-sealing them is never a bad idea"
HS series choke linkage: "Adding a beefy spring will prevent the jet from being driven down under boost. The choke is a good way to help in tuning your carbs as well. You can use it as an on demand enrichment feature to help determine if you are experiencing a lean condition or a rich condition"
Grose Jets: "All of the cool kids are using them, don't you want to be cool?" Engine breather spout: "Block this off or run a check valve in line to prevent pressurizing the crank case"
HS series tuning rod: "JB Weld seals this up nicely as long as it is in the down position"
Sealed damper cover: "A home made paper gasket will achieve this if you cannot locate one in a rebuild kit"
One set of new standard jets and at least 1 set of the next size larger than current jets. For the HS series, a new jet guide is a good idea to keep the slop down. "I like to put an o-ring at the base of the jet so when the jet is up it will help seal the base. You can still dial the jet all the way up to the bridge even with the o-ring so you will not encounter any tune ability issues. I like to add a high strength fuel resistant epoxy to the jet base where the line enters the jet on the HS series. I have not had a jet line fail for any reason other than age, but I would not like to tempt fait by overlooking it. " A few different kinds of needles: "If you search SU needles on Google their are a few shops that specialize in odd applications. You will need to get a good rolling road report with AFR logged to really nail a good profile down"
For the HIF4 and HIF6 carbs, do the above mentioned, but use an HIF44 rebuild kit for a TURBO Metro. This can be sourced from Mini Mania and others. DO NOT USE THE MINI JETS! Unless you are confident in your tuning abilities. And do not forget to install your shaft seals backwards from the way they came off! They must be reversed or they will not seal under boost! Also, investing in a book such as maximum boost by corky bell is a good idea... It will diagram the steps needed to finish the rest of the job past carb modification. You will need to use a rising rate regulator and a fuel pump capable of up to 20psi I like these units, they work well. You will also need to use fuel injection line for all the rubber lines and plumb a 3/8 return line. I prefer to drain the tank, and remove the sending unit. Then drill the sending unit and tig a return line in. Most radiator shops can do this for you without boogering the seal for the sender lead. Make sure you ditch the screw clamps and use fuel injection clamps, they really are necessary. 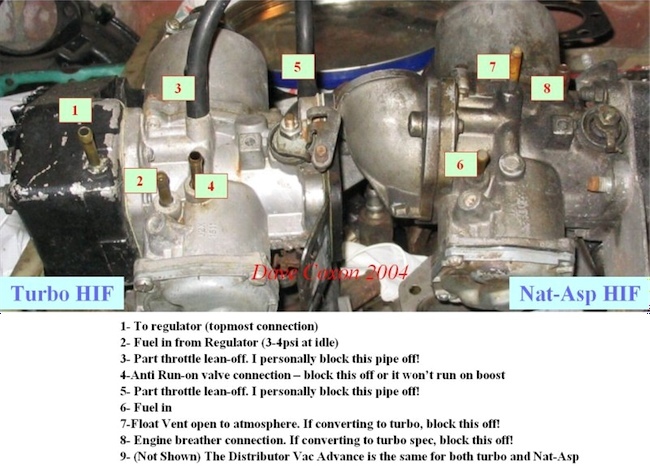 I have included a picture of the HIF44 turbo and HIF4 NA to illustrate the differences. This image came from Turbo Minis And was lovingly posted there by TURBODAVE. As all my turbo B's are out playing I had no car to photograph for this article. I hope you will visit the turbo mini site and read up on the SU in its best form. The next article will be the turbo exhaust manifold and heat shield design. Till next time, happy motoring! Comments on "How To Blow Through an SU"
carburetor for blow through application? THANK YOU. First response is Why Turbocharger instead of Supercharger?Second is Why not fuel injection, just throttle body not multi port, instead of carburetor?Thanks for the leg up. It does help. Thanks for this Tech article. My friend has a '67 GT6 and he has been running a turbo set up on it for the last 30 years. He is SUCKING the bottom out of a holley 2 barrel and has not had one iota of trouble out of it. PS: this was set up by Kas Kastners shop in LA way back when. Note; Can you say Riverside Raceway and 911's in the rear view?